The Forza franchise is the reason that I’m a fan of racing games. It wasn’t too long ago that I thought racing games simply weren’t for me, but after playing the Horizon franchise, it was love at first drive. Often overlooked as being a part of Xbox’s annualized franchise, the Forza Horizon series is much more than a simple racing game series. By combining elements of an open-world RPG and best-in-class arcade racing mechanics, Horizon appeals to those who might not otherwise think they could enjoy games in the racing genre. But after three stunningly successful games, fans might be right to worry about the series becoming stale. After spending dozens of hours with Forza Horizon 4, I’m happy to say that Playground Games has put those fears to rest. The latest game in the franchise throws out the old playbook and reinvents itself in all the right ways, and the result is one of the best driving games ever created. Forza Horizon 4 is the biggest Forza game yet, and there’s more to do than ever before. The map is absolutely jam-packed with speed zones, drift zones, off-road races, illegal street races, stunt challenges, and so much more. In addition to these activities, there are also collectibles hidden all over, including breakable influence and XP boards, scenic photo ops, homes to purchase, and barns containing classic cars. If you’d rather discover your own ways to have fun, you can create custom tracks and organized adventures to play with friends. Multiplayer modes such as “Capture the Flag” and “King,” which functions like a game of tag in reverse with the goal being to be “it” for as long as possible and avoid getting tagged. The sheer amount of things to do and see in the game is staggering, with more and more popping up just as soon as you think you’re nearing completion. And with all the options to create your own fun with custom tracks and adventures, the content to enjoy is nearly endless. And that’s all before we even begin to dive into the big, new elements that Forza Horizon 4 brings to the table. Forza Horizon 4 deviates from previous entries in the series with the addition of two massive game changers: a shared-world experience, and seasons. The Horizon Festival is now a completely online experience (though it can be played offline as well), which means it’s easier than ever to meet other players, join up with one another by creating a convoy together, and tackle events which require multiple players to overcome. Drivatars now only appear roaming the world in offline mode, and everyone you see wandering the map is doing so in real-time. To avoid any potential griefing, other players are visible, but intangible until you’ve joined a convoy together or are taking part in an organized event together (such as a drag race). The shared-world experience has been masterfully implemented. The game starts with a mandatory 4-5 hours of offline play, as you rotate through all of the seasons, learn the basics of racing and try out different event types, and start collecting cars. After that, you’ll “earn your wristband,” and officially join the rest of the players in the online world. If you’d rather experience the game completely solo, you’re able to do so, which ensures you aren’t left out in the cold. If you want the full experience, however, you’ll be given one of the most smartly designed shared-world experiences I’ve ever seen in a game. Once you enter the shared-world, you’ll be able to see other players going about their business and interact with them through quick chat commands. If you make a friend, you can easily join a convoy together and will then be able to collide with and fast travel to one another for various events. In my time with the game, I met other players roaming Great Britain who I’ve spent hours playing with on a whim. In one case, I saw another player trying desperately to nail a long-range jump and smash through an influence board (one of the collectible items in the game), and decided to give it a shot myself. Many attempts later, we both managed to smash the board and decided to join a convoy together and play some cooperative events as a team. In another instance, I met a whole crew of people at a Forzathon Live event (a public group activity that spawns somewhere on the map every hour), and after racing our way to victory, we decided to join a party together and ran some competitive adventures together. Experiences like this are at the core of why the shared-world aspect of Forza Horizon 4 is such an incredible innovation, and now I don’t think I’ll ever be able to go back to the offline experiences offered by previous entries in the franchise. The second huge addition to Forza Horizon 4 is seasonal changes. Each week, time passes in virtual Great Britain, which brings with it massive changes to the world’s terrain and limited-time events with exclusive rewards. In spring, the roads are covered in puddles and mud and rainfall makes navigating the roads a bit dicey, and in Winter, lakes are frozen solid and icy surfaces make snow tires imperative for avoiding some serious vehicular disasters. Each season has a distinct look and feel, and brings with it various gameplay challenges or advantages. The world of Horizon 4 was already big enough as it is, but now with four versions rotating each week, it feels downright overwhelming — and that’s a good thing! Whereas in previous games you’ve essentially memorized and mastered a map after a handful of hours of play, Horizon 4 keeps you on your toes for weeks at a time as geography changes and new events pop up for you to take on. Showcases return in Forza Horizon 4, and this time around there are some truly epic surprises. Fans of the series will know that showcases represent major milestones reached by the player and are some of the game’s biggest “wow moments.” Horizon 4 manages to up the ante even further with some incredibly intricate events, including one Halo-themed event that has you racing a warthog as the Master Chief himself, complete with banshee pursuers, a pelican flying overhead, and a Halo ring backdrop for added flair. These events alone are worth playing through the game, even if you don’t consider yourself a fan of racing games. Cars and customization continue to be a major part of the franchise, and this time there are more options than ever before. There are more than 450 cars in Forza Horizon 4 already, with dozens more already on the way. And with seasons changing each week, customizing your vehicle will be absolutely mandatory if you hope to be competitive. For those who would rather not get too into the weeds with customization, you can just buy additional cars and use the auto-mod system to tune the vehicle for a specific season or set of conditions. Then you can just rotate vehicles depending on the season or event in question, which makes the experience relatively pain-free. RPG mechanics also make a return in Forza Horizon 4, where banking skill points can be used to level up skill trees and make your life a bit easier. Instead of a skill tree for the player, each vehicle has its own tree with unique skills that can be upgraded as you earn skill points through extended use. Since you’re likely to switch cars fairly often, leveling up individual vehicles might lessen a feeling of overall progression, but after a while, you’ll learn to focus on leveling your favorite vehicles and build a special bond with the cars you’ve put a lot of time into playing with. In addition to buying skills, you’ll also level up in a variety of different categories, which earn you clothes for your in-game avatar, vehicles, credits, horns, emotes, and wheelspins. Wheelspins are every bit as addictive as they’ve been in the past and with more ways to level up than ever before, the game gives you every incentive to keep playing and earning awesome loot. 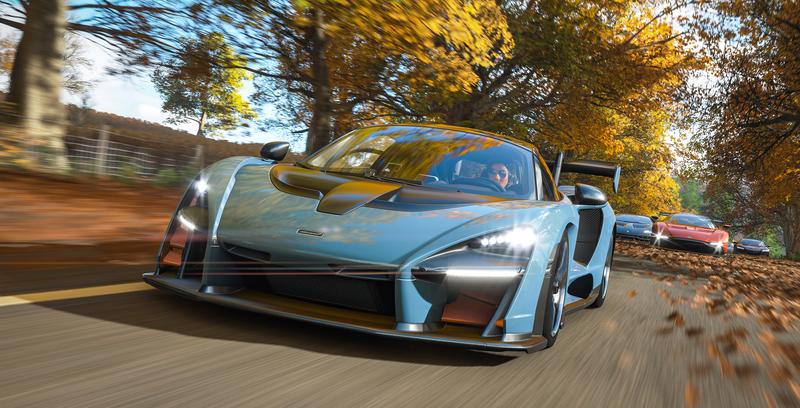 I played Forza Horizon 4 on the Xbox One X and on a high-end PC, and both version ran phenomenally and looked incredible. The Xbox One X version allows you to choose to prioritize graphically fidelity or performance, the latter of which locks the game at a rock solid 60 frames per second. HDR and 4K are both supported on both platforms, and the visuals are some of the highest quality in the industry. The game’s sound is equally impressive, boasting some of the most satisfying racing sound effects and an awesome, diverse soundtrack. My only real gripe in this regard is the painful step backwards that comes with the closure of Microsoft Groove. Horizon 4 offers no alternative for players to bring their own music into the game, which is a shame, especially since after hours of gameplay you’ll have heard all the music in Horizon 4 multiple times. In future titles, I’d hope to see Pandora or Spotify integration of some kind, if Microsoft isn’t going to continue offering their own music service.